Rainforest brown marble is a processed marble with a brown base and an intermesh design of golden and orange lines over it. This marble is surface finished and edge profiled in the production unit. Our production line in Udaipur, India is equipped with polishing machine, gang saws, block cutting machine, slab dimensioning machine, etc. To suit all application requirements, we surface finish this marble in different forms, from hones, polished, sawn cut to chiseled. Packaged in wooden crate with plastic and tharmacoal sheet and delivered at client's site, this marble is applicable in interior & exterior decoration, including flooring, countertops, steps, risers, paving and wall cladding. 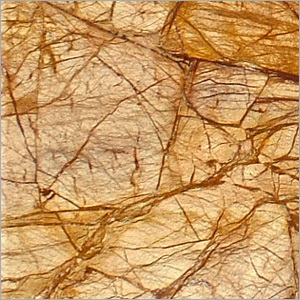 The clients can avail rainforest brown marble in any slab size, tile size and thickness from us.